Recent advances in modern imaging techniques that can be used non-invasively for the visualization of the human brain have greatly enhanced the knowledge of brain anatomy and the understanding of its relationship to brain function. A unique new MRI modality, called diffusion tensor imaging (DTI) allows the three-dimensional study of the large white matter (WM) fiber bundles at macroscopic resolution (millimeter scale). 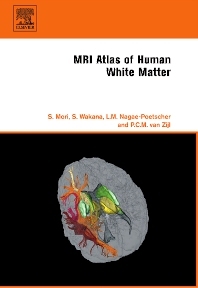 MRI Atlas of Human White Matter provides a three-dimensional and two-dimensional in vivo atlas of various white matter tracts in the human brain. The images are based on diffusion tensor imaging and various tracts are reconstructed three-dimensionally from the data. Following an introduction and description of the methodology (Chapters 1 and 2), the 3D anatomy of individual tracts is delineated in Chapter 3. Chapter 4 consists of a series of color-coded orientation maps to delineate white matter anatomy in a slice-by-slice manner, in which the structures are extensively annotated. This richly illustrated Atlas is a valuable resource for students studying white matter anatomy and researchers working in brain research and radiology. This book also provides the structural assignment, which will assist neuroradiologists when interpreting diffusion tensor images in routine clinical studies. Radiologists and doctors in neuropathology, neurology and psychiatry. Anatomists, researchers involved in brain research, NMR Imaging specialists and medical/graduate students.